Don’t worry, we can repair your upholstery. Yes, don’t worry. I can fix that for you. Having been trained by some of the best people in the country and amassed a huge pool of knowledge in terms of leather upholstery repair. You can be assured of great service and attention to detail. 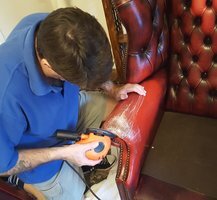 You don’t need to understand everything about the it, but if you are interested Leather upholstery repair Doncaster will walk you though the process. We will examine your upholstery under the microscope to find out exactly what type of leather it is or what it’s made from. From this and the visual inspection we will be able to tell you what is and what is not possible. We won’t tell you we can do something that is not possible. Or that will look good for a while and fall apart! We can repair some pretty horrific looking cracked and scratched up leather furniture. Not everything, but a lot of it. When you contact us we will come to give your leather suite a free inspection and a free quote. We do not hard sell! To be honest our services are so much in demand in Doncaster that you will have to wait for the work to be done anyway. We fit you in as soon as possible, but we do have a large client base here in Doncaster. So when we say ‘we’. Who are we? Well we are a family firm living and working in Doncaster. You will never get an employee. There are five of us, so you can understand why we can’t book you in the same day! What we can guarantee is first class service and satisfaction. After all it should be that way anyway. So what can leather upholstery repair Doncaster do for you? Well apart from the usual cat and dog scratches. The cracked arms and the dried out leather. We can completely change the colour of your leather upholstery. Why would you want that. Well you most probably took ages looking for a leather sofa that you really liked. One that would fit your home and would match in with your décor. So now you have changed your wall and curtain colours from the fashionable dark reds of yesteryear to the bright and breezy colours of your current taste. Trouble is, you are stuck with a comfortable leather sofa in Burgundy. We can fix that. You want it in cream? No problem. We will re colour your leather for you. Whatever your leather upholstery repair requirements are we can tell you your options. We will give you free quote with absolutely no obligations. We do it all the time. Call us today on: 01302 272102 Or text: 075 4488 0558 for a free consultation.